I competed in the Cross Country State Meet for all four years of high school: 2015 (19:56, 31st), 2016 (19:36, 18th), 2017 (19:27, 20th), and 2018 (19:17, 14th). I competed in the Track State Meet last year (2018) in the 1600m (5:22, 13th) and the 3200m (11:36, 10th). How did you first get involved with track, and what other sports do you do? I started running track when I was in ninth grade when my track team was formed. Before that, I ran Cross Country beginning in eighth grade when my parents started our homeschool team. I only compete in cross country and track, but I also enjoy cross country skiing with friends in the winter. While the State Track Meet last year was very memorable, I would say that qualifying for State in the 1600m at Sections was the most memorable. I vividly remember coming around the corner for the last 300 meters. My teammates had stationed themselves all around the outside edge of the track so they could cheer for me throughout the race. I remember hearing them screaming as I pulled into first place to win the race, set a PR, and qualify for the State meet. Tell us a little bit about how the Northwest co-op works and how you got involved with it. My family established and continues to run the team on a volunteer basis, so I have been involved since the beginning. This program provides homeschooled students the opportunity to be part of a competitive team while building relationships among participants, their families, and the local community. Each homeschool is considered a separate school, so we all co-op to create a MSHSL-sanctioned team. As a team, we serve our local community at various events. Tell me a standout memory from your athletics career. At a meet last cross country season, the rain started pouring so hard that everyone was sent to their cars and buses. When we heard that the meet had been canceled, we went to pack up our camp. It has been a team joke for a long time that if we ever get caught in a thunderstorm on a run, we would smear mud on our faces for effect. Even though we weren't technically out for a run, we decided to do pushups in the rain and smear mud on our faces anyway. We then went to a team family's house to play pool, eat watermelon, and go for a run. I have always enjoyed running against the Howard Lake-Waverly-Winsted girls. 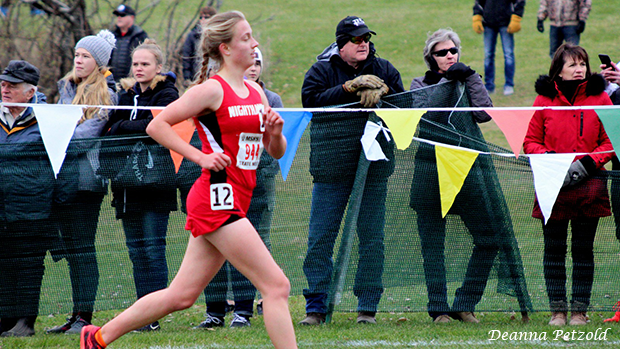 At races during the past several seasons of cross country and track, I have talked to (and sometimes even warmed up, cooled down, or cheered with) Gwen Helgeson, Gracie Mallak, and Erin Brabec. 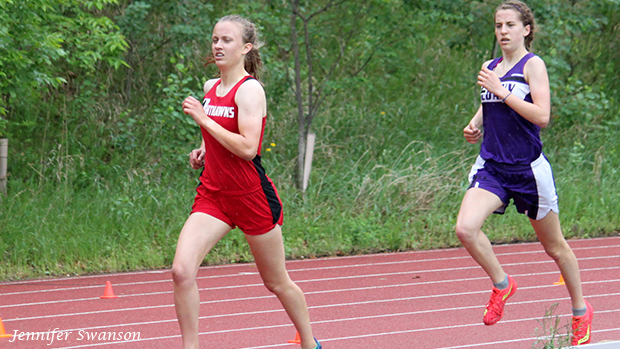 I am excited to continue competing with Gwen and Erin in the coming years as we are all going to MIAC schools. My parents are always ready to help me with my training, but they also can step back and let me do my own thing. They love helping me train to reach my goals, and I enjoy watching them come up with workouts to help my teammates reach their goals, too. I can remember very few runs where I had to run alone because my younger brother Luke and I have been running and training together from the beginning. We have had many strange conversations over the years, and we end up laughing on most of our runs-once, Luke was laughing so hard he had to stop to catch his breath. My parents coach my team, so they come and cheer at every meet. Luke and my other teammates also always cheer for me. Our team is very supportive, and we get excited for each other no matter what meet or event we are competing in. My grandma also comes to most of my meets, and she usually hangs out with my younger sister and my other younger brother who are not yet on the team. 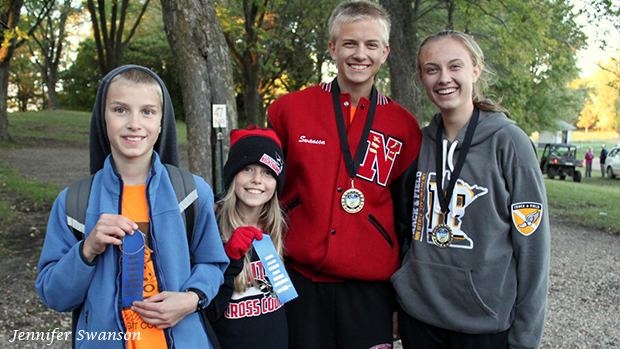 At most meets, my younger siblings and the younger siblings of my teammates come up to talk to me after my races. I am excited for all of them to compete with the Nighthawks in the future! What is a challenge you have had to face as an athlete, and how did you face it? Many female athletes face the challenge of staying strong and fast as they grow up and mature. I hit a bit of a performance plateau in track of 10th grade. In the winter of 11th grade, I focused on strength. I did weightlifting, and I started doing 100 pushups every day. This improved my leg strength and my upper body strength. In my 11th-grade season of track, I dropped my 1600m time from 5:30 to 5:20 and my 3200m time from 11:54 to 11:36. I want to focus on the 1600m this season and take off more time, so I can qualify for the State Meet again. I would also like to run the 4x800m relay because I have only run that once due to the small size of our team. My teammates and I have a lot of fun. Even in some of the less difficult workouts, you can find us encouraging each other by name. Most of all, we are looking forward to cheering for each other and hanging out at meets. I will be competing in cross country and track at Bethel University. I have already met several of the girls on the team, and they are so fun to hang out with! Because I have always loved nature, birds, and other animals, I will be majoring in Biology as I pursue a career as an interpretive park naturalist and wildlife researcher. The night before every meet, my family and I eat spaghetti. My dad makes delicious sauce with meat and all kinds of vegetables. I don't do any pushups before my race (except for a few burpees as part of my warmup routine), and for the bigger meets like Sections and State, I also skip my pushups for the day before the meet. Throughout the day of the competition, I make sure to drink plenty of water. About an hour and a half before my race, I eat a small snack, and I eat again as soon as possible after my race. Since eighth grade, I have volunteered over 500 hours for nature-related organizations including the Three Rivers Park District and the University of Minnesota Raptor Center. These experiences have increased my interest in nature and a related career field. I like drawing nature (birds especially), and I recently began painting with watercolor. 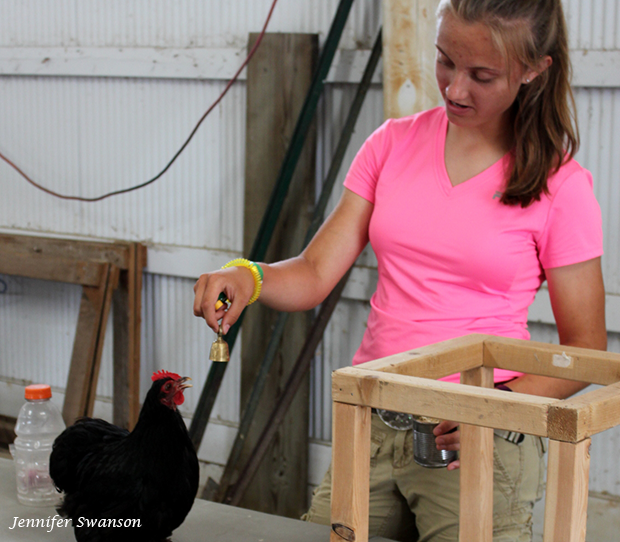 I live on a hobby farm, and I raise poultry and have clicker-trained a few of my hens to perform tricks. My current trick hen, a Bantam Cochin named Ms. Frizzle, knows how to fly up to a perch, step on and off of my hand, knock over an empty bottle, distinguish and peck a red milk cap from other colored milk caps, walk through a tunnel, and come when called. I also enjoy playing pool with my siblings and friends. Pushups (and squats, lunges, and pretty much any other strength exercises) are your friends! If you don't PR every race, don't get discouraged because the next meet will be a new chance to do your best. I raise poultry, and last year, I kept the bones from one of my meat chickens. I then rearticulated it into a full skeleton as a supplemental lab for my bird biology course. My family and I named it Mr. Stuart "Stewie" Bones, and I presented it in 4-H at the Wright County Fair and the Minnesota State Fair.